As many of you know, here lately I've been trying to be proactive and knock some things off my Pinterest "to do" list, AKA my "DIY" pin board. You can find it here! Be sure to click "Follow All" so you can follow me on Pinterest and keep up with my latest blog posts and pins. I figured I would just wait a little bit and do this project once the glass ware went back on sale the next time I went to Hobby Lobby. Did I mention that I was cooking spaghetti tonight? DURH! I always use "Classico" sauces and save the jars because they are Mason Jars! So, no $ spent there. The first step is obvious. Use your spaghetti sauce. And it was delicious :-) I washed out the jar after I used all my sauce until it was clean. The second step is simply to get the label off. Rubbing alcohol works wonders. I had Windex Multi-Surface on hand so I simply saturated the label with it... let it sit for 5 minutes and started to rub it off. *TIP* If you do are doing a few of these soap dispensers, run the jars through a dishwasher. Take out while dishwasher is in "drying" stage. This will be when the label is the softest and easiest to take off. 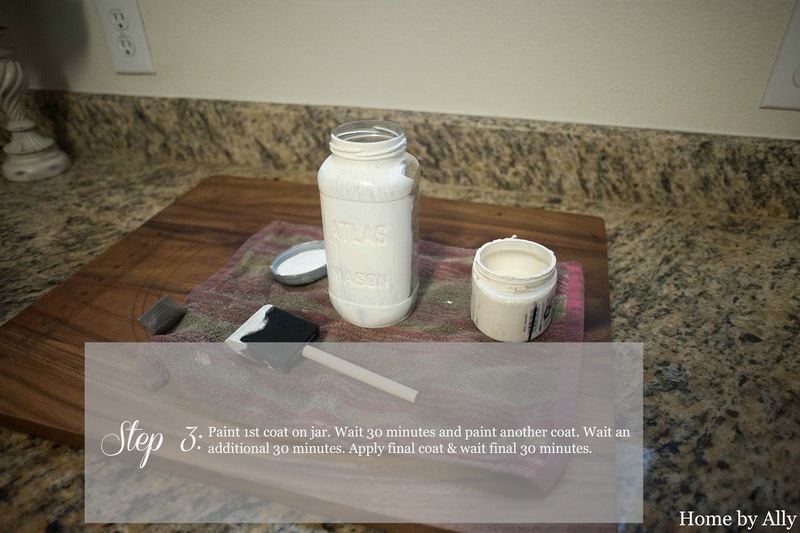 Step number three is to paint your first coat on your jar. I used my Valspar Color Samples... I love these little things. This little container of paint goes a long way and they have the cutest colors! I am totally LOVING their fall line right now! You have to check it out! I absolutely adore how it turned out! This would be cute in a small wide mouth mason as well! I plan on doing this for all of our restrooms in our home. Different colors would be cute too! I see a shabby pink for a little girls room or a bright blue for a boys bathroom. Endless possibilities! This is just the plain paint but I decided (of course as my husband says) to distress it just a little to give it some character.... so now here is final result numero dos! The finish on top of my soap dispenser matches my sink faucet so that is why I choose this one. I think an oil bronzed top would look amazing and I plan to do that one next for our master bathroom. So, what do you think? 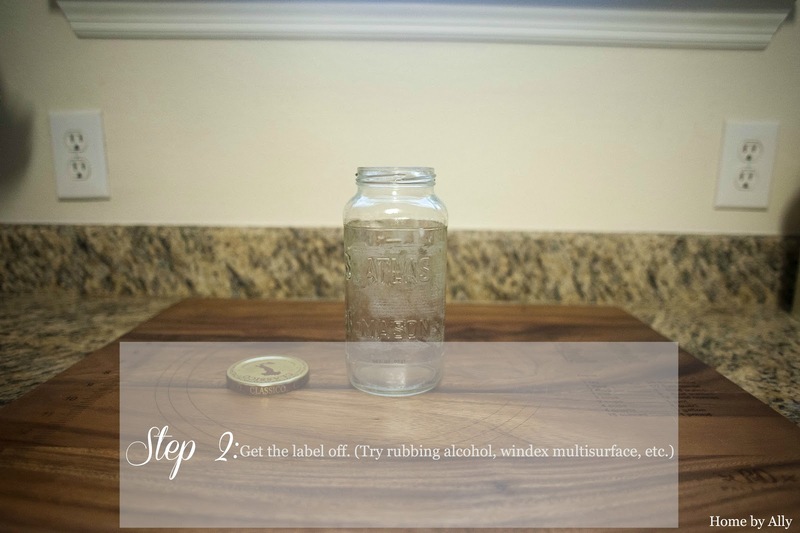 Are you going to try this DIY? And did I mention that this project costs me $0. Absolutely nothing! Hopefully it goes this well for you, I would love to hear about it! I love it! This is so creative... I need to tell more people about your blog! You need to be on HGTV or something!!! 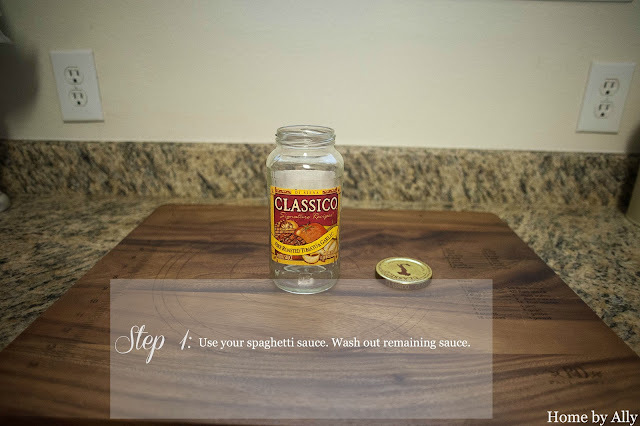 I have a cute little Classico pizza sauce jar left over from tonight's dinner that I wanted to try this with. :) Did you have to glue the top onto the lid at all? Or does the tube going through the hole keep it in place? Love the distressed look! Hi Ally. Where do you purchase the dispensers? Do you need to glue the dispenser to the top of the lid? Many thanks for your response. I love this idea!! Hi! You can get them at the Dollar Tree but I found one super cheap I believe at Walmart or Ross. I didn't glue it! And I still love it to this day! I adore this, Ally! 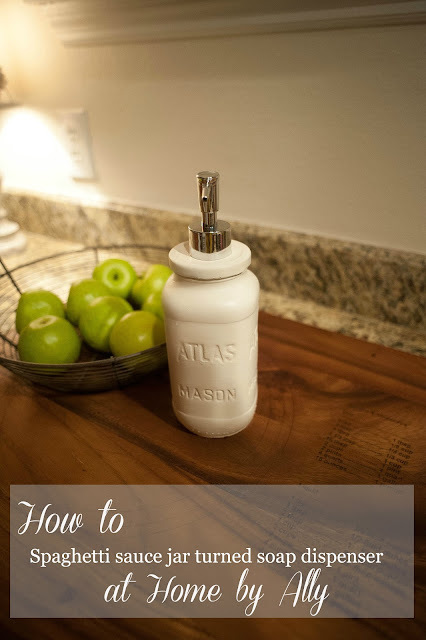 So easy ~ I definitely want to try this because I can never find soap dispensers that I really like. I hope you do try it! I still love it! We're a gaggle of volunteers and opening a brand new scheme in our community. Your site offered us with valuable information to work on. You have done an impressive job and our whole community will probably be thankful to you. fresh spin on a topic that's been written about for ages. Wonderful stuff, just excellent! on the same information you discuss and would really like to have you share some stories/information. 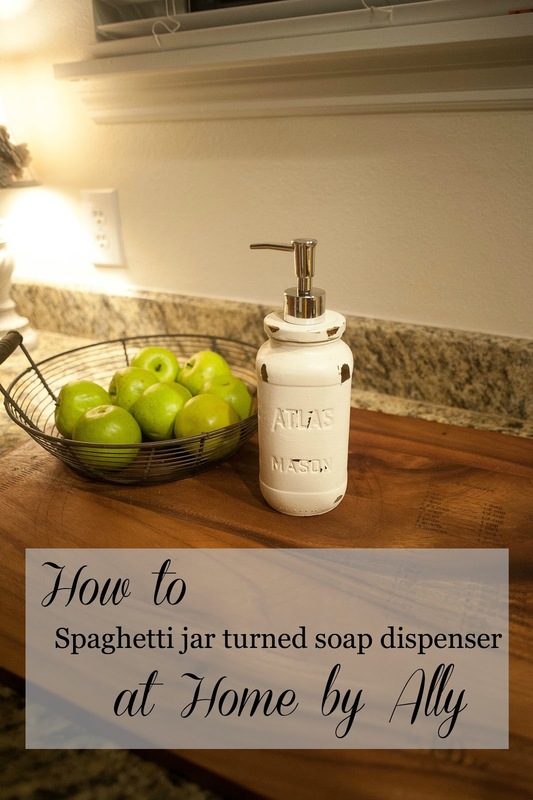 I do not comment, however I read a few of the remarks on this page "How to: Use a spaghetti sauce jar to make a soap dispenser". Could it be simply me or does it appear like some of the remarks look as if they are left by brain dead visitors? :-P And, if you are writing on other online sites, I would like to follow you. What's Taking place i am new to this, I stumbled upon this I have discovered It positively helpful and it has helped me out loads. I hope to contribute & help different users like its helped me. Great job. The clarity in your post is just spectacular and i can assume you're an expert on this subject. Well with your permission allow me to grab your RSS feed to keep up to date with forthcoming post. Thanks a million and please keep up the enjoyable work. It's not my first time to pay a quick visit this website, i am browsing this web page dailly and get nice information from here all the time. It's amazing to pay a quick visit this web site and reading the views of all colleagues on the topic of this piece of writing, while I am also zealous of getting know-how. It kind of feels too complex and very wide for me. I'm looking forward to your next publish, I will try to get the cling of it! more, "pop"! Your content is excellent but with pics and clips, this site could certainly be one of the greatest in its field. I as well am an aspiring blog blogger but I'm still new to everything. Do you have any tips and hints for newbie blog writers? I'd definitely appreciate it. article I looked at. 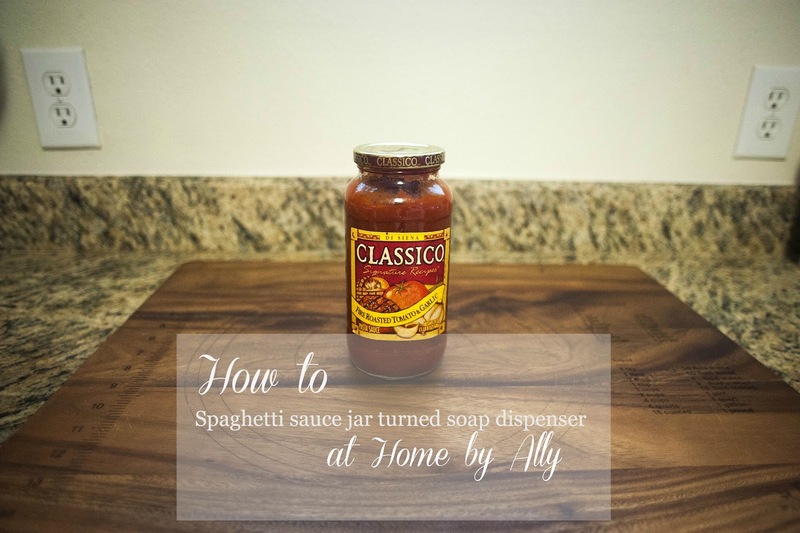 And on this post "How to: Use a spaghetti sauce jar to make a soap dispenser". I was actually moved enough to drop a comment :-) I actually do have some questions for you if you don't mind. Is it simply me or do a few of these remarks come across as if they are left by brain dead visitors? :-P And, if you are writing on other places, I'd like to keep up with anything new you have to post. Hi there, You've done a fantastic job. I will definitely digg it and personally recommend to my friends. I am sure they'll be benefited from this site. Love this! Curious about the exact measurements of the hole you drilled vs. the pump (and where you got your pump) you inserted? I know with some you have to go through the trouble of gluing the collar of the pump to the dispenser and others you don't. We only just pre-drilled the hole for the pump and didn't glue the lid so we could still access it in the future :) I believe the pump came from an older dispenser I had but I have seen cheap ones at Ross, Walmart, etc, even the dollar tree! HOW TO: Make a paper wreath!